Monarch Air Group provides private air charter in Birmingham, United Kingdom. Our clients benefit from top-notch service, unrelenting dedication to safety, wide selection of aircraft, and years of experience in chartering private jets. To obtain a free quote, please use our online quoting tool provided below, or call toll free 1-877-281-3051. Monarch Air Group is among the most respected private charter brokers in the world providing extravagant charter flight services to and from Birmingham, United Kingdom. With 14 airports within 50 miles of Birmingham, Birmingham is an incredibly popular travel destination. The most obvious choice is the Birmingham Airport (BHX), which is located within the actual city. The most common aircraft types include light jets (Citation Bravo, Citation CJ2 and Premier I), midsize Jets (Learjet 60XR and Hawker 800 XP) and large jets (Challenger 604, Gulfstream G450 and Legacy 600). We also have access to ultra long range jetsб turboprops, and VIP airliners. 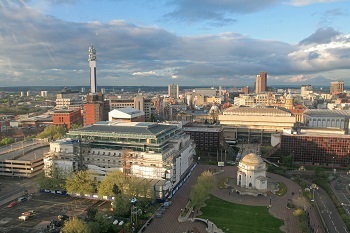 Located in the West Midlands, Birmingham is Britain’s second largest city. After the Industrial Revolution in England, Birmingham was known as “the workshop of the world” or the “city of a thousand trades”. It is an important economical, commercial, conferences, and retail center along with an established high tech, research and development sector, supported by its three Universities. England’s second cultural center, after London, Birmingham, boasts many interesting sites to visit from modern developments like Millennium Point, to areas such as Digbeth, which are steeped in history. The most popular attractions are the National Exhibition Center, Royal Ballet, Jewellery Quarter, Bull Ring market, Birmingham Museum & Art Gallery, Victoria Square, Aston Hall, Town Hall and Symphony Hall, Soho House, Castle Bromwich Hall and Gardens, and Cadbury World. With a number of wonderful museums, art galleries, superb theaters, great cinemas, and amazing shopping, Birmingham attracts tourists from all over the world.